Most of my partners are fully evolved, only Shy and Isane aren't red, and Mugetsu is missing 3 items (I stopped to continue knowing I will dump him soon or later), I am in stasis with the evo now. I didn't get Granz, only on another platform for the lulz, ain't gonna spend 1000+ golds for one Granz when I am limited with the gold. For the boost you can check the picture below (lv.100 Mayuri vs lv.50 Grimmjow, both unupgraded). I would say burn the SA points for the other goodies, not on Minazuki, Mina starts to shine only at lv.100 and more, do you have a ton of mod soul card saved to reach that level ? Grimmjow and/or Granz are the important pick and endgame mod soul, get 'em when you can, some events (mostly seasonal/holiday ones) give the frags for free or for a very cheap price. Aim for lv.50 Grimmjow or Granz on all 5 partners then you're good for a looooooong time. Oh lel, well I get ~1k inferno each season, that's almost two years for Tsuki ? Maybe I will get him maybe not (as I am saving every ressources I have now, explaining why my increase is low the previous month), I am not fan of him. CBA Can't Be Arsed, too lazy. But hey, remember... KS can be fully utilized if it goes 2nd. As long as your team is tanky enough to take a hit from enemy support you are gold. Oh so that isnt the fury mode it had the same icon so i thought its the same. Getting grantz are you joking they wont give in any event not holiday or seasonal its vip item not a f2p one. So if i cant get grantz nor grimm then does minazuki is the only option left? Thats some awesome stats comparison sacrificing HP for speed and DMG ofcourse its a good item and that too for lvl 50. Too bad its out of reach for a looooooooooooooong time. Yes thats why i said if they ever announced inter server transfer i am going to come to your CSB. Its too stuffed in here. 220~240 is the limit per month of how much inferno you can get. You are lazy too good to know. dont get too frustrated, muken was there when i got the account and bag had already 8K+ inferno for the next stage. Its just that i am not very good at CSB like the owner who knows in and outs and had strategies. I bet if i was given the account for least 2-3 months later i would have been playing with both muken and KS. Its just says how gameplay depends and varies player to player. Just not skilled enough. How much do you have now? 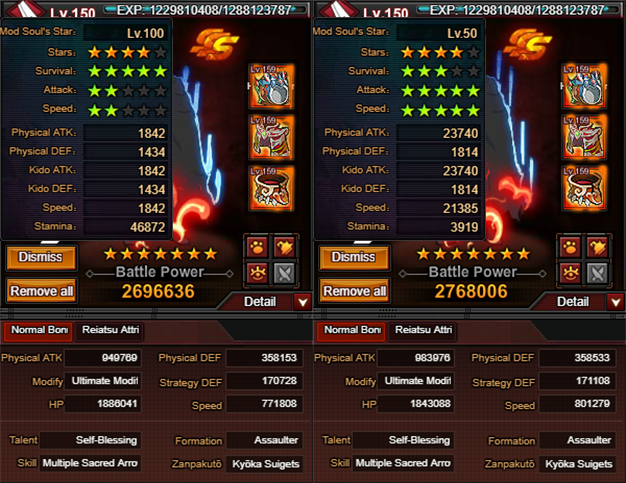 If you close to muken and you already have good Assualters go for KS if you dont have Tensa. Yes and their in lies my problem. Its better to see BR but you dont see it so i will try to put in 30 words or less. If you have can give a BR that would help lol! It really depends on what he is using and the type of formation he is using. 1. You can get some better supporters to use their CC debuff to control his Assaulters. 2. If you don't want to change formation, you can slow down your support by removing agi stuff off them and switch them up to Assaulter line up. 3. Simply speed up your assaulter with more agi stuff if that decides your battle. 4. Different main character skills might come in handy... but then again, depends on formation type. There are so many type of tactics you could use... it really depends on the enemy. It's win-win, more ATK = more HP for the shield (if it kicks in) and protects immensely the team instead of himself only. Will provide BR's tomorrow the win one with TEnsa and the lost one with KS. I think one is posted in Interesting battle thread where i couldnt know why his B.Kisuke skipped and gave chance to my muken, Rugal helped there. A freash one is always good. GMT-5, 2019-4-23 05:49 , Processed in 0.029097 second(s), 8 queries , Xcache On.